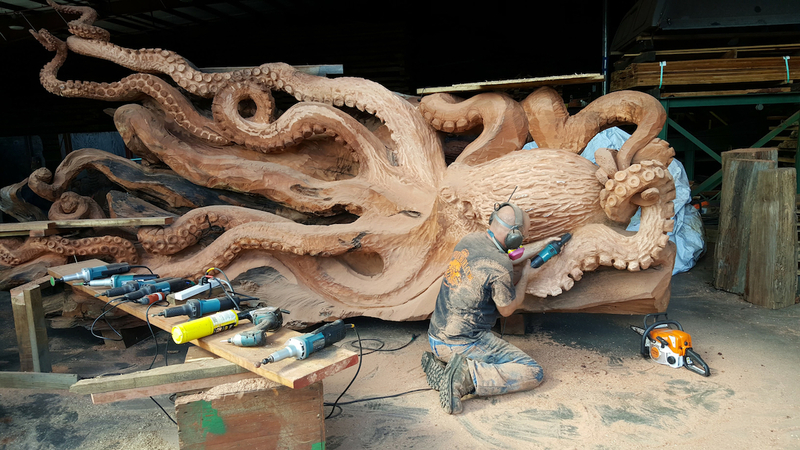 Washington-based woodcarver Jeffrey Michael Samudosky has been creating elaborate figural works from a variety of Pacific Northwest trees since he started his company JMS Wood Sculpture in 1998. 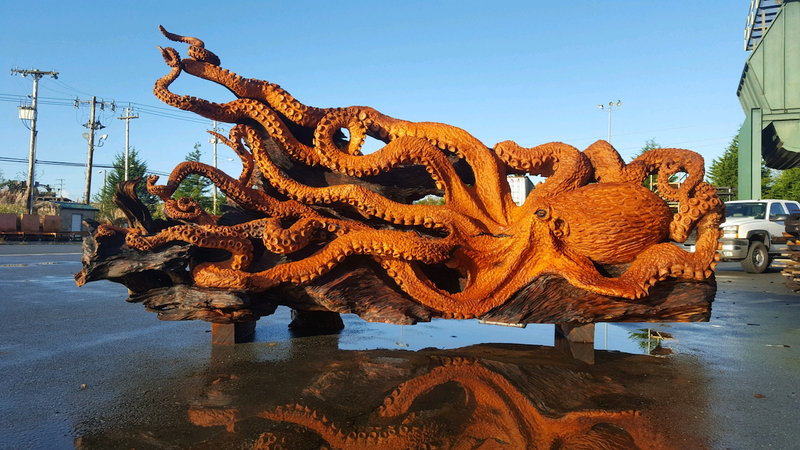 One of his most recent projects is a replica of an Enteroctopus dofleini, or Giant Pacific Octopus, carved from a fallen Redwood given to him by Redwood Burl. The cephalopod’s tentacles curve and twist their way across areas which Samudosky left natural, including the entire back of the trunk which gives the illusion that the octopus is on top of the tree, rather than a part of it. Ceramic artist Keiko Masumoto is intensely interested in the intersection of art and craft, whether a craft object can simply be decorative or if an artistic work can still remain functional. Her questions have resulted in a series of traditional ceramic plates, bowls, and vases embedded with unlikely objects from wriggling octopuses to entire buildings. You can explore a bit more in her online portfolio and at Spoon & Tamago. Inspired in part by his graphic-designer friends disparaging comments about the lowly ballpoint pen, artist Ray Cicin took it upon himself to collect all their discarded pens and embarked on this drawing of a mammoth octopus. The piece is inspired by German naturalist Ernst Haeckel’s famous illustration of squid and octopi, and is part of Cicin’s ongoing Deep Blue series. You can follow more of his work on Instagram. As part of the San Luis Obispo Museum of Art’s annual California Sculpture SLAM, Oakland artist Courtney Brown unveiled this unweildly typing device titled “Self Organization,” that went on to win first place. Brown used a 1938 Underwood typewriter affixed with sculpted bronze tentacles. We can’t wait to read its first book. All of the sculptures from the event are still on view through November 15, 2015.